Private equity appetite appears set to increase its focus on opportunities in datacenter and cloud. The third party datacenter sector is still a relatively immature one – in market structure, productization, marketing and globalization. There are still relatively few quoted players and many highly fragmented markets. But private equity investors see great scope for moving to IPO, and scaling up regional players. CoreSite and Telx managed floats in 2010, as well as Malaysian player CSF in London, but a better market outlook would have seen several others. We expect further flotations to occur in 2013. Investors like the REIT model in the industry, and particularly companies like US company Digital Realty (DLR) with a current market capitalization of around US$7.94 billion. They also very much like the model – blue chip clients, average lease period of around 13 years, annual rent escalators, sticky clients and formidable lease clauses. From a broader property angle, they also see data centres as an ‘alternative asset’ and even an opportunity to convert unsold commercial properties into datacenters. Other investors look more at M&A activity and stock performance in the sector. Until around 2005, investors were particularly deterred by fears of a repeat of a dot com bust and industry over-supply, the sheer cost of new build datacenters and the perceived risks in the industry. 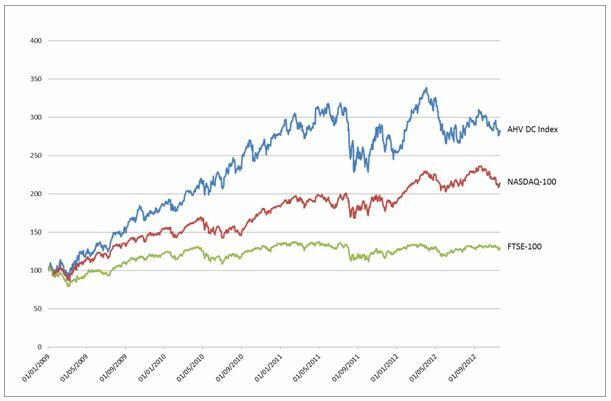 But market valuations of publicly quoted players in the sector have consistently outperformed both Nasdaq and FTSE over the past few years (see chart above). So even through the darkest of recessions, the industry has proven resilient and the market performance of players such as TelecityGroup (TCY.L), Rackspace (RAX) or DuPont Fabros (DFT) has been exceptional. Investors want to gain access to these ‘growing tech stocks’. Businesses rely completely on Internet speed and the increasingly complex management of data. Such “cloud” data must be stored offsite at colossal data and colocation centers – facilities housing computers, servers, telecommunications and storage equipment, and systems to backup and protect data with resilient power and cooling systems. Huge datacenter developments are underway by the likes of Google, Amazon and Apple in the United States. Europe is now in its third stage of evolution with datacenters targeting vertical segments such as cloud, media, and other financials presenting a more challenging marketing proposition. At the same time the third party datacenter industry is still relatively immature in internationalization which has particularly attracted private equity investors who see scope for scaling up regional players and potentially moving to IPO. China is catching up too, with current research by BroadGroup revealing the development of 30 very large scale “cloud” datacenter builds underway across 17 provinces with a total investment value of US$44 billion. Investors are rightly concerned about markets that ‘seem too good to be true’ and the datacenter market presents a number of challenges, of which the two most pressing are the risks of over-supply and the lack of experience and expertise of many new entrants. Supply hot spots, such as New Jersey, Santa Clara and the outskirts of London did emerge in recent years. Datacenter start-ups often have fewer than 10 employees, with very limited background and understanding of the market. The first question for every investor is to see the elusive anchor tenant – not just the first tangible revenues for the site but some validation of the offering and provider. The other key investor concern – that we may see a ‘return’ to post dot com days – is not valid. The market has totally changed over this period, and demand is now much broader, deeper and more varied. The market structure will look a lot different in 2-3 years’ time, and there are a lot of opportunities for investors to benefit from this consolidation. However, many ill-conceived start-ups in the sector will also fail, and great care needs to be taken in the backing the ‘right horse’. A common enterprise approach is to use a combination of leasing and ownership. This allows companies to control a primary datacenter and outsource less strategic ones. This can also provide an emergency back-up. Some of the world’s largest companies, including banks, outsource certain functions such as email and order processing, while keeping their core financial applications in-house. The outsourcing of datacenters is part of a trend to remove the fixed costs of IT, or to keep them low, while accessing the flexibility to add programmes and products. But the greatest driver is power, its availability, quality and price. BroadGroup believes that power will become more important than space as a differentiator for datacenters over the next few years*. While the “Big 4” markets of London, Amsterdam, Frankfurt and Paris remain dominant, location continues as an issue. For location agnostic enterprises, the increasing opportunities of a new European “power hinterland” – Norway, Ireland, Switzerland, Iceland and Finland and other countries present the ability to tap vast renewable energy resources with long term fixed price contracts. This outcome fits with the wider scheme of globalisation – to a point. An assessment of countries which have proferred themselves as outsourcing destinations over the past few years offers some indications of what will happen next.